Low herbaceous plants, tall grasses, rich, muddy soil and standing water characterize the marsh biome. Marsh ecosystems can be freshwater or saltwater, tidal or non-tidal and support a wide variety of animal life from insects to egrets and even one of the largest predatory reptiles on earth, the alligator. Smaller mammals like rabbits, otters, beavers, raccoons and muskrats make their home in freshwater, non-tidal marshes. These marshes occur far from the coast near the boundaries of rivers, lakes and ponds. Larger mammals like deer and bears live in and around freshwater marshes, frequently passing through on their way to graze and hunt. Even predatory big cats inhabit marshes; the wild panther is indigenous to the Everglades in Florida. The marsh contains millions of invertebrates from butterflies to shrimp. Insects like mosquitoes, earthworms, dragonflies, grasshoppers and diving beetles dominate marshland. However, invertebrates aren’t relegated to life on land within the marsh environment. Mollusks like snails, oysters and conch as well as crustaceans like crabs, shrimp and hermits meander back and forth between marsh water and land, particularly in brackish or saltwater marshes. Birds permeate the marsh environment. Both freshwater and saltwater tidal marshes create the perfect environment for migratory water birds like geese, ducks and egrets. Sparrows, rails, gulls and herons are common birds living in saltwater marshes. Aquatic birds like ducks and cormorants rely on the marsh’s tall grass for nesting, while smaller birds, like terns, feast on a variety of insects and crustaceans within the biome. 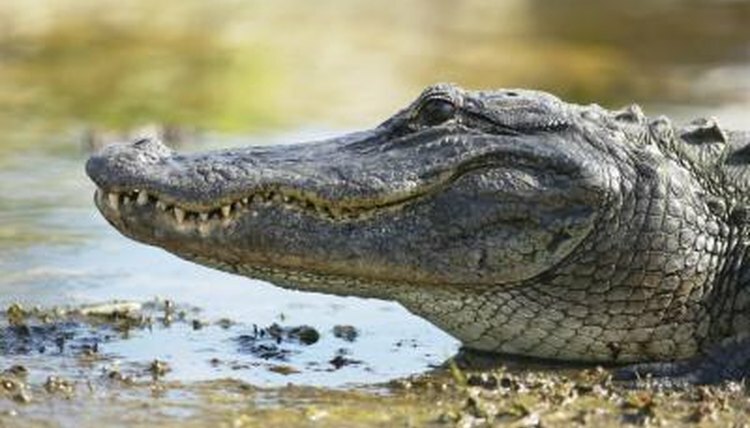 Perhaps the largest, most ferocious marsh reptile, the alligator, is indigenous to the largest freshwater marsh in the United States -- the Everglades. However, alligators are far from the only reptiles found in marshes. The Everglades alone hold 50 reptilian species, including 27 species of snakes and 16 species of turtles. Some of the most common marsh reptiles are turtles, tortoises, snakes and lizards.